26th FFC Keynote Speaker, Dr. Garth Nicolson, to present the use of oral Membrane Lipid Replacement therapy for treating chronic fatigue in aged patients or chronic fatigue syndrome patients. 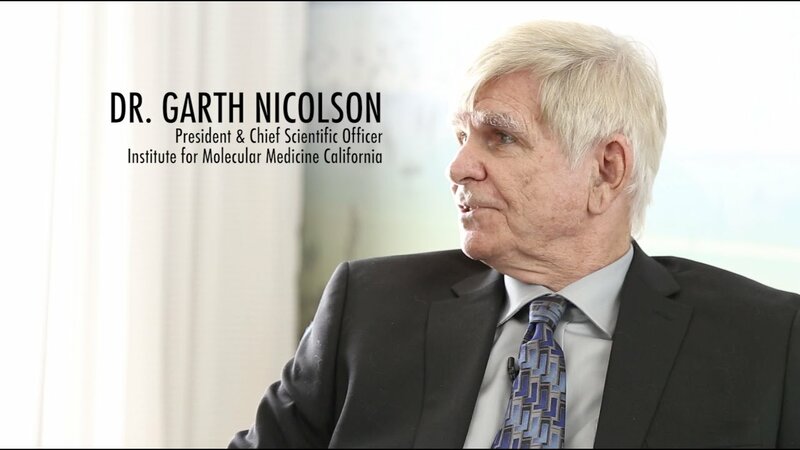 Garth Nicolson, MD, PhD, is the Founder, President, Chief Scientific Officer, and Professor of Molecular Pathology at The Institute for Molecular Medicine in southern California. We are extremely fortunate to have Dr. Nicolson present as the keynote speaker at the FFC’s 26th International Conference and Expo on May 9-10, 2019 in San Diego, California. During the presentation, Dr. Nicolson will discuss the connection between reduced mitochondrial functioning with fatigue and pain in aging and chronic diseases. Additionally, he will cover the causative role that elevated levels of reactive oxygen species (ROS) play in this reduced mitochondrial functioning. Finally, Dr. Nicolson will present his recent work studying the role that oral Membrane Lipid Replacement therapy can play in improving mitochondrial function, and in subsequently reducing fatigue and pain symptoms experienced by aged patients and chronic fatigue syndrome patients. Anyone who has heard of the Fluid Mosaic Model of the plasma membrane has heard of Dr. Nicolson. Beyond this groundbreaking finding that he co-authored with S.J. Singer in 1972 , Dr. Nicolson has achieved countless other successes throughout his 50 year career in molecular medicine. In 1996, Dr. Nicolson founded The Institute for Molecular Medicine in Huntington Beach, California and has served as the institute’s President, Chief Scientific Officer and Emeritus Professor of Molecular Pathology ever since. He also serves as Conjoint Professor at the University of Newcastle in Australia and as Professor of Integrative Medicine at Capitol University of Integrative Medicine. Prior to these appointments, Dr. Nicolson held numerous appointments in prominents universities throughout the state of Texas, including serving as the Former David Bruton Jr. Chair in Cancer Research, Professor and Chairman of the Department of Tumor Biology at the University of Texas M.D. Anderson Cancer Center . The dedication Dr. Nicolson has shown to passing on knowledge to future generations extends beyonds professorship. Not only has he published over 600 medical and scientific publications, but he has also served on about 30 medical and scientific journals, including the Journal of Cellular Biochemistry and Journal of Functional Foods in Health and Disease. Dr. Nicolson has also contributed to editing many scientific books, holds 9 US patents, and was a Nobel Prize Nominee . Dr. Nicolson’s commitment to applying molecular research to manage, treat, and prevent chronic diseases has not gone unnoticed by the scientific community. He has received numerous accolades, including the US National Cancer Institute Outstanding Investigator Award and the UK Burroughs Wellcome Medal of the Royal Society of Medicine. Dr. Nicolson was also appointed an honorary Colonel of the US Army Special Forces and an honorary US Navy Seal for his influential work on chronic diseases in both veterans and those on active duty . Shortly after completing his doctorate in biochemistry at the University of California, San Diego in 1970, Dr. Nicolson and Dr. Singer developed a novel model for the structure of cell membranes, known to modern science as the fluid mosaic model . The model describes cell membranes as being composed of a fluid phospholipid bilayer containing similarly fluid-moving peripheral (surface) and integral (embedded) proteins . This article would come to be regarded as a classic paper within the scientific community and the model itself would become the foundation of our scientific understanding of cell membrane structure. In addition to this groundbreaking finding, Dr. Nicolson has been actively engaged in basic and translational research surrounding chronic diseases, including fatigue illnesses, autoimmune diseases, and cancer. Of note is Dr. Nicolson’s pioneering work on the scientific understanding and subsequent treatment of Gulf War Illness, a chronic fatigue illness that plagued many war veterans who returned from the Gulf War in 1991. Dr. Nicolson, along with his wife Nancy, led the research that ultimately led to the identification of a causal pathogen, Mycoplasma fermentans, and successful treatment of patients with antibiotics . Dr. Nicolson is also widely known for his work on lipid replacement therapy, particularly as it relates to chronic fatigue illnesses and cancer. Lipid replacement therapy was first invented by Yechezkel Barenholz and Elishalom Yechiel in 1989 as a novel treatment method for anti-aging . Dr. Nicolson expanded upon their work and provided the scientific understanding for the anti-aging benefits observed with lipid replacement therapy. He established the concept that replacing damaged membrane lipids with new lipids improves the function of cell and organelle membranes . This was particularly important for the mitochondria, where improved membrane function resulted in improved mitochondrial ATP production, and thus contributed to the anti-aging process . Dr. Nicolson found that this was also beneficial to patients suffering from chronic fatigue illnesses and those undergoing cancer chemotherapy . Dr. Nicolson has established a strong research program at The Institute for Molecular Medicine that continues to improve our understanding of and ability to treat and manage chronic diseases. Of particular interest is Dr. Nicolson’s work describing the treatment of chronic disease with natural supplements, as it relates to mitochondrial functioning. He details how fatigue is a key complaint in nearly all chronic diseases and thus improving mitochondrial functioning is crucial to managing symptoms . He details clinical trials providing evidence for the utility of oral L-carnitine, coenzyme Q10, NADH, lipids, and other supplements for improving mitochondrial function and reducing fatigue . Some of his other work has focused on malignant transformation, including the connection between the fluid-mosaic model of the plasma membrane and growth of metastatic cancer cells. In this work, Dr. Nicolson details the role that membrane constituents play in cell adhesion and motility and further suggests how these constituents are likely abnormally transformed during metastatic transformation . In another study, Dr. Nicolson and his team identified a novel gene that is overexpressed in cancer cells, metastasis-associated gene 1, mta1 in mice or MTA1 in humans . They utilized cDNA to compare gene expression between non-metastatic and metastatic rat mammary adenocarcinoma cell lines and concluded mta1 was more highly expressed in the metastatic line . Since this discovery, many studies have reported overexpression of MTA1 in malignant human tumors . Nicolson, G. L. (2014). Mitochondrial Dysfunction and Chronic Disease: Treatment With Natural Supplements. Integrative Medicine: A Clinician’s Journal, 13(4), 35–43.